NYC, 05/15/2019, 2:00PM. 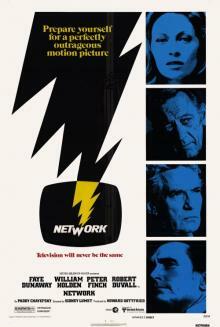 Four Time Oscar Winning Network (1976): Tv Will Never Be The Same. 121 min. Director: Sidney Lumet. Starring Faye Dunaway, William Holden, Peter Finch. Network won four Academy Awards, in the categories of Best Actor, Best Actress, Best Supporting Actress, and Best Original Screenplay. In 2000, the film was selected for preservation in the United States National Film Registry by the Library of Congress as being "culturally, historically, or aesthetically significant". In 2007, the film was 64th among the 100 greatest American films as chosen by the American Film Institute.